Football fans will be tuning in to watch both the NFC and AFC championship games today, to see what two teams will be playing in the Super Bowl next month. Movie fans will also get a sneak peak at Warner Bros.' King Arthur: Legend of the Sword, which is set to open in theaters on May 12. This new preview shows how Arthur, played by Charlie Hunnam, rises from nothing to become king, which comes just a day after the new poster surfaced. Way back in 2014, Warner Bros. Pictures set a summer 2016 release date for this movie, which is said to be the first in an epic six-movie series. That date was eventually pushed up to March 24, 2017, where it would have gone up against Lionsgate's Power Rangers, Warner Bros.' CHiPs and Sony's Life. The date was eventually pushed to May 12, putting it up against 20th Century Fox's Snatched, starring Amy Schumer and Goldie Hawn, and High Top Releasing's Lowriders, starring Eva Longoria and Demian Bichir. It also falls between Marvel's Guardians of the Galaxy Vol. 2 on May 5 and 20th Century Fox's Alien: Covenant on May 19. Acclaimed filmmaker Guy Ritchie brings his dynamic style to the epic fantasy action adventure King Arthur: Legend of the Sword. 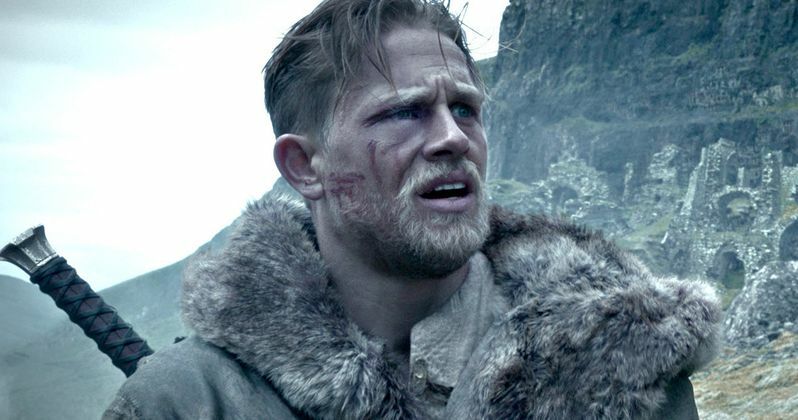 Starring Charlie Hunnam in the title role, the film is an iconoclastic take on the classic Excalibur myth, tracing Arthur's journey from the streets to the throne. When the child Arthur's father is murdered, Vortigern (Jude Law), Arthur's uncle, seizes the crown. Robbed of his birthright and with no idea who he truly is, Arthur comes up the hard way in the back alleys of the city. But once he pulls the sword from the stone, his life is turned upside down and he is forced to acknowledge his true legacy...whether he likes it or not. The supporting cast includes Astrid Bergès-Frisbey, Djimon Hounsou, Aidan Gillen and Eric Bana. Guy Ritchie directs from a script by Joby Harold and Guy Ritchie & Lionel Wigram, based on a story by David Dobkin, who was originally slated to direct this film, and Joby Harold. While Warner Bros. hasn't officially set up any sequels yet, this movie is supposed to be the first in a six-movie series, written by Joby Harold. These sequels will likely be dependent on how this first movie fares in theaters, which may not be easy, opening in such a competitive summer field. Akiva Goldsman produces alongside Joby Harold, Tory Tunnell, Steve Clark-Hall, Guy Ritchie and Lionel Wigram, with David Dobkin and Bruce Berman serving as executive producers. The key source material for King Arthur: Legend of the Sword is Thomas Mallory's "Le Morte d'Arthur," published in 1485 as a compilation of French and English tales. Arthur is believed to have been a 6th century King, and he defended Britain against the Saxon invaders. Take a look at this new sneak preview of King Arthur: Legend of the Sword below.